I am scheduled for up to 14 doses of Interleukin-2 over the next 5 days. Three times per day starting at 6AM, 2PM and 10PM. Mine will begin tonight at 10. It takes about 15 minutes for it to enter my body. They expect my blood pressure to drop pretty quickly. This is one of the leading causes that some cannot complete the full 14 dose cycle. My nurse tells me that most people don't get more than 9. Apparently it will start messing with my head as well and some claim to hallucinate. I get tested each day by the nurse. A series of questions such as, "What is the day of the week? ", "What is the name of the president? ", and then asked to "Spell the word 'world' backwards." Very confusing stuff when asked quickly. After failing a few too many questions, they will send you home. Amy was with me today. She waited while I had the catheter installed. The procedure was fairly quick and I was awake during the whole thing. They had me under what they call twilight sedation. I knew what they were doing, I just didn't care. Pretty cool stuff! They obviously used some sort of local as well as the pain set in a little while later. Just a little discomfort. The strangest part is that I can feel the tube as it is sitting close to my neck area as I swallow. That is quite painful. 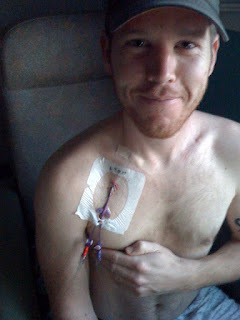 The catheter ended up be much smaller than I had originally thought. Here is a picture. Sorry, I tried to keep it G-rated. The room is nice, I am all alone in here and I have my own bathroom. I've got a great view of downtown Baltimore. I don't have a view of the stadium, but I do have a good glimpse of the world's famous Popeye's restaurant. Man, I'm in need of some red beans and rice! For those who are gonna press their luck and travel to the city to see me. I'm in The Sidney Kimmel Comprehensive Cancer Center at Johns Hopkins. I'm in the Weinberg Building Room 5D-07. I'd suggest parking at the Orleans street parking garage. If you are driving east on Orleans street as you arrive near the campus you'll pass under a pedestrian bridge with Johns Hopkins Medical Campus posted on the side. The garage entrance is just after the bridge on the right side of the road. You can then walk across the bridge and head west towards Popeyes. Turn right on to North Broadway and then right on to Jefferson street. That should take you to the main entrance. Ask the security guard to show to the elevators. Or you can call me at (410) 502-0345. Don't worry, if I don't feel like talking, I won't pick up. It's almost 9 PM now. I have some meds coming to prepare me for my first dosage. I have no idea how quick this stuff will work. The nurses all say that I'm pretty much going to feel like crap so I'm taking their word for it. I'll try to keep everyone up to date as this thing progresses. Have you ever been hit by a bus? I've completed the 14 dose regimin! The morning after and my MRI results. Happy Cinco de Mayo, at least is not swine flu! Dude, what's wrong with your mole?